This post has affiliate links. Any purchases you make will help support this blog. Thank you! The adult coloring book craze is still going strong and I'm frequently asked what people can do with their completed images. I've turned mine into faux stained glass and an altered pencil box. Now I'm turning them into place cards for Thanksgiving. Leisure Arts recently sent me their latest coloring book and two different marker sets to try out. I fell in love with the page that was full of cute owls. I colored them in with the double-ended markers and the gel pens, then cut them out with my beloved microtip scissors. 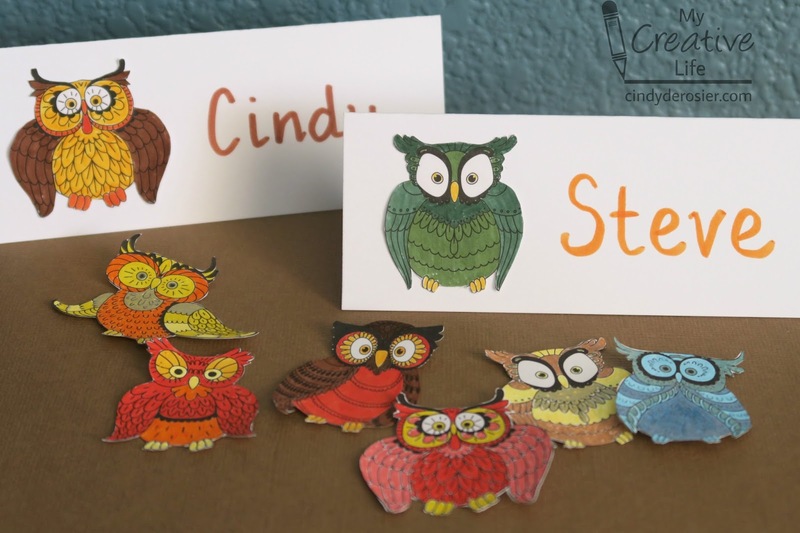 While I was coloring and cutting owls, these three were coloring as well. Look how pretty the pens are, all spread out on the table. 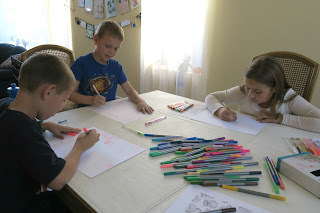 My assistant coloring book and pen testers had lots of feedback for you. They liked the coloring book images a lot and thought the fall theme was a lot of fun. They felt that some of the designs were too detailed. They'd prefer more variety, with a mix of simpler and more detailed images. They liked that some pages were full scenes, while others had individual elements, like the owls. Overall, Bountiful Wonders Color Art for Everyone got all thumbs up. The kids had nothing but great things to say about the gel pen set, except that they wished it had a brown. Other than that, it has gorgeous colors, including glitter, metallics, and fluorescents. They wrote well and added a beautiful touch to our drawings. The double-ended markers were a hit too. The kids liked having the option of the two different tip sizes and loved that the caps interlocked with each other. At first, they couldn't tell at a glance which end was which and didn't like having to open the cap to tell which tip size it was. But Avery noticed that the ridge the cap butts up against is different for the two different ends, so that made all the difference. 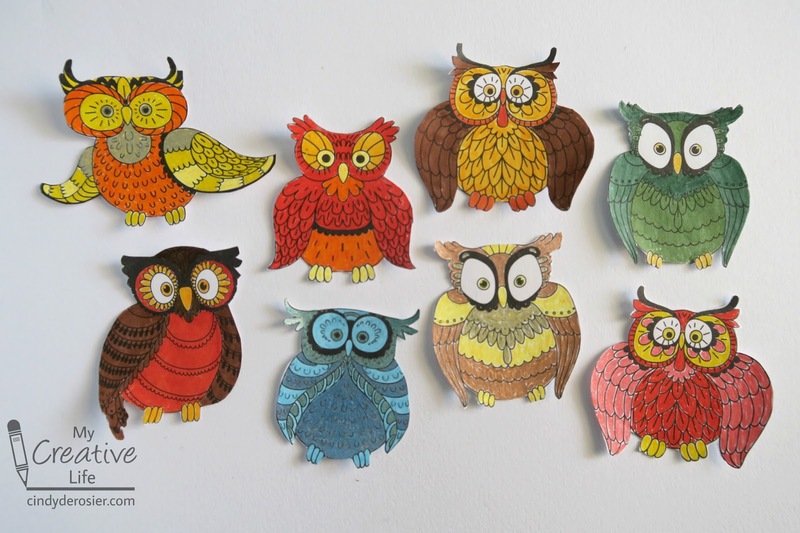 Color the owl images with the pens. Use microtip scissors to cut out the images. 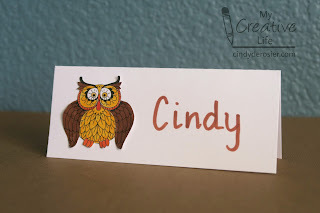 Cut and fold the cardstock to make place cards. 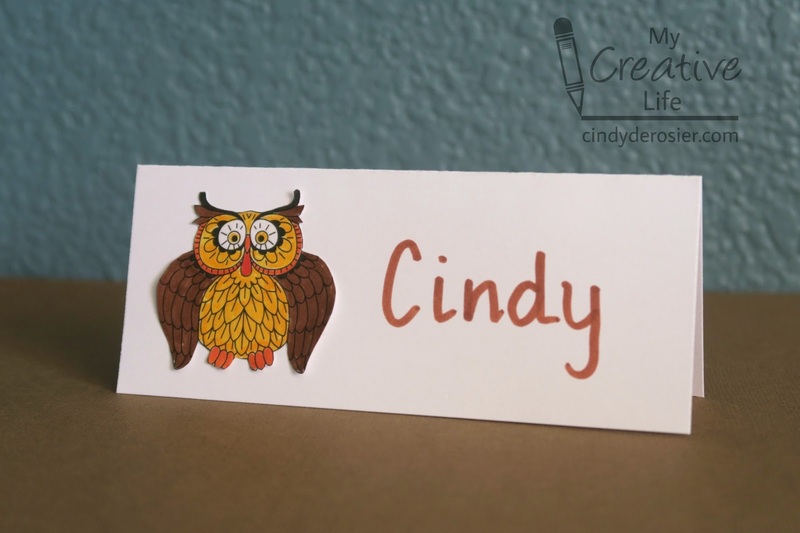 Glue one owl to each place card, then write the guest's name. 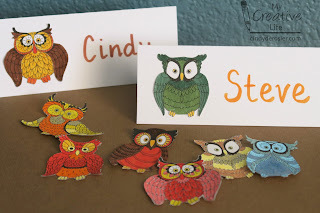 Or, set up a coloring station where guests can color their own owl! I'm a firm believer that any get-together can be enhanced with some crafting. Loveeeeeee those place cards! What a great idea to get the images from the books for those!!! Brookie has really gotten into this craze ... me, not so much! LOL!!!!! 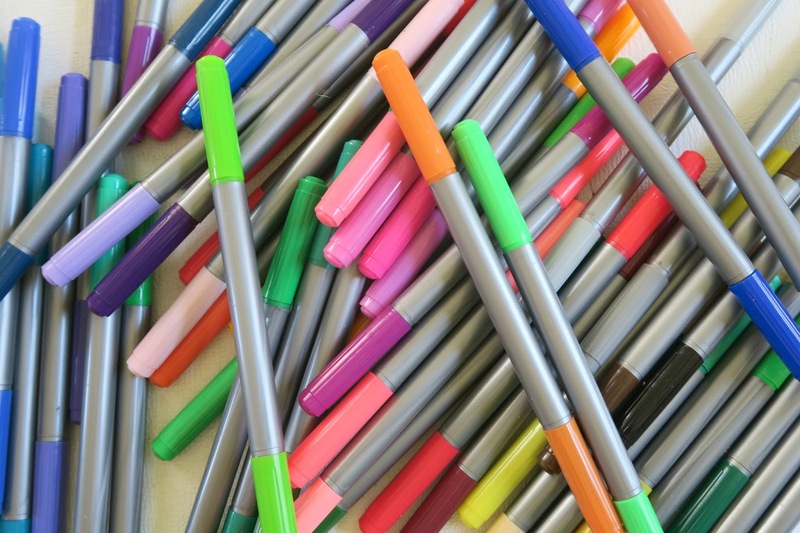 How is the quality of the double ended markers? They are comparable to higher-end consumer markers, like Crayola, not artist-quality. I enjoyed coloring with them for a project like this.